The tutorial shows three different ways to hide rows in your worksheets. It also explains how to show hidden rows in Excel and how to copy only visible rows. If you want to prevent users from wandering into parts of a worksheet you don't want them to see, then hide such rows from their view. This technique is often used to conceal sensitive data or formulas, but you may also wish to hide unused or unimportant areas to keep your users focused on relevant information. On the other hand, when updating your own sheets or exploring inherited workbooks, you would certainly want to unhide all rows and columns to view all data and understand the dependencies. This article will teach you both options. As is the case with nearly all common tasks in Excel, there is more than one way to hide rows: by using the ribbon button, right-click menu, and keyboard shortcut. To select one row, click on its heading. To select multiple contiguous rows, drag across the row headings using the mouse. Or select the first row and hold down the Shift key while selecting the last row. To select non-contiguous rows, click the heading of the first row and hold down the Ctrl key while clicking the headings of other rows that you want to select. With the rows selected, proceed with one of the following options. Go to the Home tab > Cells group, and click the Format button. Under Visibility, point to Hide & Unhide, and then select Hide Rows. Alternatively, you can click Home tab >Format > Row Height… and type 0 in the Row Height box. Either way, the selected rows will be hidden from view straight away. In case you don't want to bother remembering the location of the Hide command on the ribbon, you can access it from the context menu: right click the selected rows, and then click Hide. 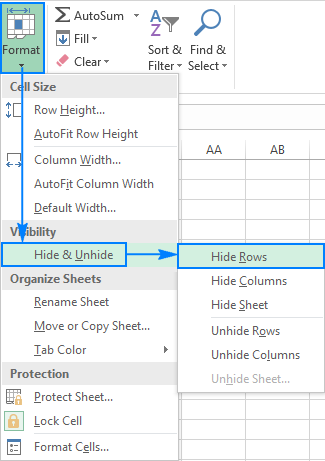 As with hiding rows, Microsoft Excel provides a few different ways to unhide them. Which one to use is a matter of your personal preference. What makes the difference is the area you select to instruct Excel to unhide all hidden rows, only specific rows, or the first row in a sheet. On the Home tab, in the Cells group, click the Format button, point to Hide & Unhide under Visibility, and then click Unhide Rows. You select a group of rows including the row above and below the row(s) you want to unhide, right-click the selection, and choose Unhide in the pop-up menu. This method works beautifully for unhiding a single hidden row as well as multiple rows. Pressing this key combination (3 keys simultaneously) displays any hidden rows that intersect the selection. In many situations, the fastest way to unhide rows in Excel is to double click them. The beauty of this method is that you don't need to select anything. Simply hover your mouse over the hidden row headings, and when the mouse pointer turns into a split two-headed arrow, double click. That's it! Please note that in Microsoft Excel, this shortcut behaves differently in different situations. If the cursor is in an empty cell, the whole worksheet is selected. But if the cursor is in one of contiguous cells with data, only that group of cells is selected; to select all cells, press Ctrl+A one more time. Press Ctrl + Shift + 9 (the fastest way). Select Unhide from the right-click menu (the easiest way that does not require remembering anything). On the Home tab, click Format > Unhide Rows (the traditional way). To unhide all rows and columns, select the whole sheet as explained above, and then press Ctrl + Shift + 9 to show hidden rows and Ctrl + Shift + 0 to show hidden columns. Depending on which rows you want to unhide, select them as described below, and then apply one of the unhide options discussed above. To show one or several adjacent rows, select the row above and below the row(s) that you want to unhide. To unhide multiple non-adjacent rows, select all the rows between the first and last visible rows in the group. For example, to unhide rows 3, 7, and 9, you select rows 2 - 10, and then use the ribbon, context menu or keyboard shortcut to unhide them. Hiding the first row in Excel is easy, you treat it just like any other row on a sheet. But when one or more top rows are hidden, how do you make them visible again, given that there is nothing above to select? The clue is to select cell A1. For this, just type A1 in the Name Box, and press Enter. Alternatively, go to the Home tab > Editing group, click Find & Select, and then click Go To… . 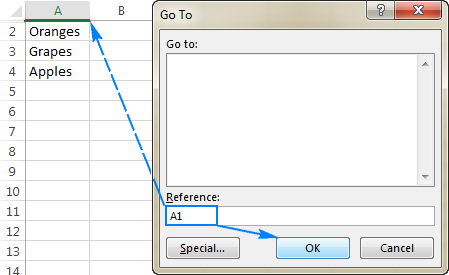 The Go To dialog window pops up, you type A1 in the Reference box, and click OK.
As you have just seen, hiding and showing rows in Excel is quick and straightforward. In some situations, however, even a simple task can become a challenge. Below you will find easy solutions to a few tricky problems. Select the range that contains empty cells you want to hide. On the Home tab, in the Editing group, click Find & Select > Go To Special. In the Go To Special dialog box, select the Blanks radio button, and click OK. This will select all empty cells in the range. Press Ctrl + 9 to hide the corresponding rows. If you want to hide blank rows in Excel, i.e. the rows where all cells are blank, then use the COUNTBLANK formula explained in How to remove blank rows to identify such rows. To hide and show rows based on a cell value in one or more columns, use the capabilities of Excel Filter. It provides a handful of predefined filters for text, numbers and dates as well as an ability to configure a custom filter with your own criteria (please follow the above link for full details). To unhide filtered rows, you remove filter from a specific column or clear all filters in a sheet, as explained here. Select the row beneath the last row with data (to select the entire row, click on the row header). Press Ctrl + Shift + Down arrow to extend the selection to the bottom of the sheet. Press Ctrl + 9 to hide the selected rows. Select an empty column that comes after the last column with data. Press Ctrl + Shift + Right arrow to select all other unused columns to the end of the sheet. Press Ctrl + 0 to hide the selected columns. Done! 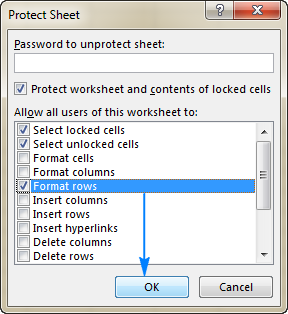 If you decide to unhide all cells later, select the entire sheet, then press Ctrl + Shift + 9 to unhide all rows and Ctrl + Shift + 0 to unhide all columns. If your worksheet contains hundreds or thousands of rows, it can be hard to detect hidden ones. The following trick makes the job easy. On the Home tab, in the Editing group, click Find & Select > Go To Special. Or press Ctrl+G to open the Go To dialog box, and then click Special. 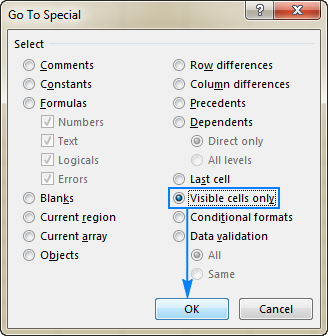 In the Go To Special window, select Visible cells only and click OK.
Supposing you have hidden a few irrelevant rows, and now you want to copy the relevant data to another sheet or workbook. How would you go about it? Select the visible rows with the mouse and press Ctrl + C to copy them? But that would also copy the hidden rows! Go to the Home tab > Editing group, and click Find & Select > Go To Special. In the Go To Special window, select Visible cells only and click OK. That will really select only visible rows like shown in the previous tip. Press Ctrl + C to copy the selected rows. Press Ctrl + V to paste the visible rows. If you have troubles unhiding rows in your worksheets, it's most likely because of one of the following reasons. Whenever the Hide and Unhide features are disabled (greyed out) in your Excel, the first thing to check is worksheet protection. For this, go to the Review tab > Changes group, and see if the Unprotect Sheet button is there (this button appears only in protected worksheets; in an unprotected worksheet, there will be the Protect Sheet button instead). So, if you see the Unprotect Sheet button, click on it. If you want to keep the worksheet protection but allow hiding and unhiding rows, click the Protect Sheet button on the Review tab, select the Format rows box, and click OK. Tip. If the sheet is password-protected, but you cannot remember the password, follow these guidelines to unprotect worksheet without password. In case the worksheet is not protected but specific rows still cannot be unhidden, check the height of those rows. The point is that if a row height is set to some small value, between 0.08 and 1, the row seems to be hidden but actually it is not. Such rows cannot be unhidden in the usual way. You have to change the row height to bring them back. Select a group of rows, including a row above and a row below the problematic row(s). Right click the selection and choose Row Height… from the context menu. 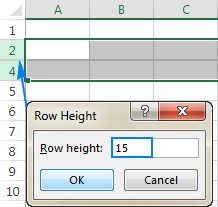 Type the desired number of the Row Height box (for example the default 15 points) and click OK. This will make all hidden rows visible again. If the row height is set to 0.07 or less, such rows can be unhidden normally, without the above manipulations. If someone has hidden the first row in a sheet, you may have problems getting it back because you cannot select the row before it. 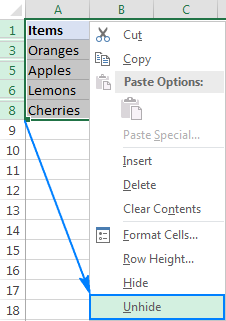 In this case, select cell A1 as explained in How to unhide top rows in Excel and then unhide the row as usual, for example by pressing Ctrl + Shift + 9. If none of the above tips has worked for you, there is a chance that the hidden rows are a result of filtering. In this case, clear the filters, as explained in How to remove filter in Excel. 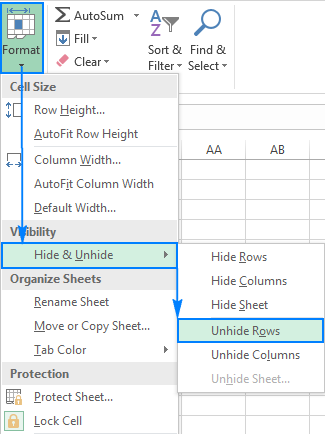 This is how you hide and undie rows in Excel. I thank you for reading and hope to see you on our blog next week! 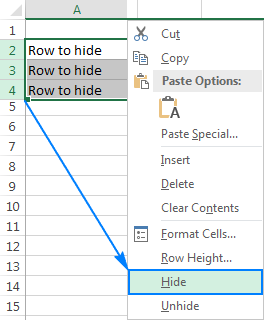 4 Responses to "How to hide and unhide rows in Excel"
I have 530 rows hidden and I don't want to sit and double click 530 times to unhide ALL of them. Is there not a way to unhide a rediculous number of hidden rows all at once? I have same problem. I still cannot unhide Rows even I have done every steps in this suggestion. Thank you very much for this information. Always appreciate those who extend the effort to those who wish to learn. Amazing, the most comprenhensive information I have found, one of the tips solved my problem. Thanks a lot!